Pensacola Beach has its native sons and daughters, to be sure. But it embraces many more adopted ones. They’ve sipped the island’s spiked, slushy alcoholic milkshake known as a Bushwacker. They’ve enjoyed a sun-kissed swath of unpeopled solace at Gulf Islands National Seashore, communing with clouds and shorebirds. They’ve sunk toes in the powdery white sands, building castles, scanning the sparkling emerald green waters for dolphins. They’ve tasted the lobster-like deep-water shrimp, known as Royal Reds for their scarlet hue. They’ve chatted with Panhandle locals who have soft, salt-tinged Southern accents. They’ve exchanged easy smiles with strangers. These are the once-and-forever-measures of a perfect beach vacation. Once known as Isle de St. Rose, Pensacola Beach predates St. Augustine, Florida, and Jamestown, Virginia. Pensacola was discovered in 1559 by Spanish explorer Don Tristan de Luna. Compared to many other coastal destinations, Pensacola Beach has managed to successfully honor its past. Open-air trolleys make getting from one end of the island to the other a breeze during the busy season. 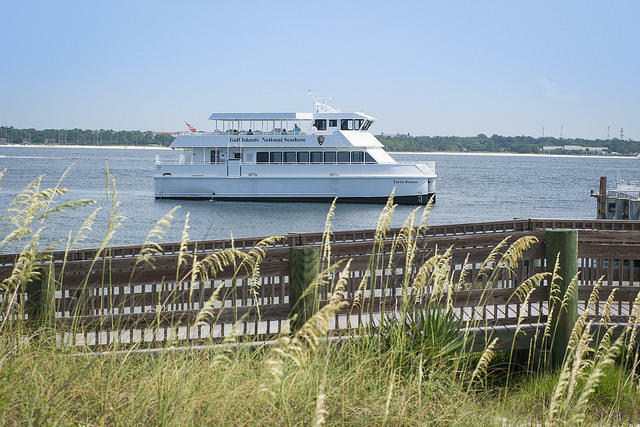 And Pensacola Bay Cruises, set to debut in 2018, will shuttle passengers between Downtown Pensacola, Pensacola Beach and Fort Pickens. This is smart progress for the future. But much endures, unchanged. Like the iconic, animated neon sailfish that points you toward the Bob Sikes Bridge. And the friendly tollbooth collectors that patiently wait for you to fish $1 worth of change from your console. Or the same weekly fishermen along the 1470-foot Pensacola Beach Gulf Pier. Like the funky “UFO House” as you head east on Via de Luna, past the Avenidas. And the 10-foot concrete Island Cross—miraculously spared from storms—as you head east toward the historic heart of the island, Fort Pickens. 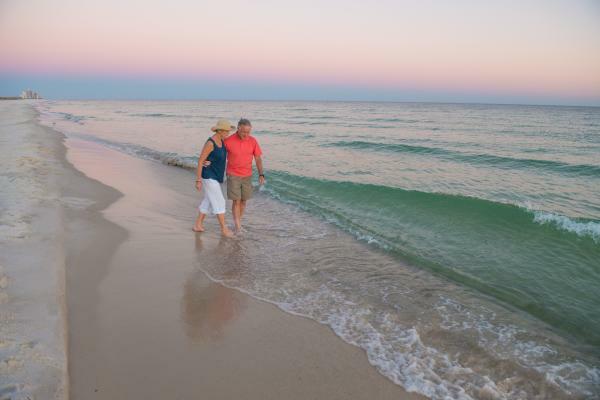 Thanks to low-density development and nationally protected strands on both ends of the island, Pensacola Beach retains a laid-back vibe that old-timers cherish and newcomers embrace—especially in these fast-paced times. Celebrations are second nature on the beach. Like the Mardi Gras Parade because…beads. And the weekly Bands on the Beach because… music. And a Go Irish on the Island pub crawl because…beer. The Taste of the Beach festival because…seafood. Or the Bloody Mary Festival because…Sunday. And of course, the granddaddy of all festivals, the Pensacola Beach Air Show with the Navy’s Blue Angels…because this is the Cradle of Naval Aviation. But the real reason we return to the island, again and again, is the beach itself. In 2018, Pensacola Beach was awarded Florida’s Best Beach for the second time in a row, and the Gulf Islands National Seashore was named best Florida Attraction in two different 10Best Readers’ Choice Awards, chosen by the readers of USA Today and 10Best. Walk the wrack line, a tangle of poetic sea gifts left at high tide, or wade knee-deep along the water’s edge. There are so many intact shells for the collector, including lettered olives and lucinas, whelks and slippers, turbans and tulips. But also, fascinating fragments: the bronzed lip of a conch; the enormity of a weather-bleached half sand dollar; the caramel swirl of a chipped bittersweet; a battered, rosy barnacle. And cool discoveries, like the leathery black skate egg cases known as “mermaid’s purses” and sea sponges. It’s exhilarating to see ghost crabs skittering into their holes. It’s thrilling to hear the unmistakable roar of the Blue Angels overhead. It’s breathtaking to watch a mango sun drop into the Gulf at day’s end. And it’s soothing to fall asleep to the lullaby of crashing waves. Whether you were lucky enough to grow up here or you’re among the fortunate who’ve found it, welcome, friend, to our splendid island. 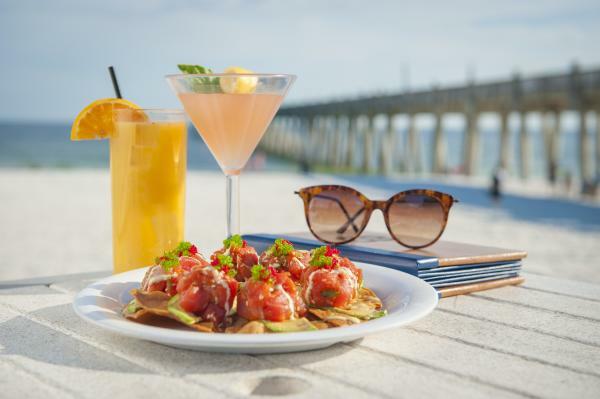 With world-class seafood readily available at our fingertips and over 450 years of differing cultural influences, Pensacola Beach serves up some serious flavors. Beneath our casual, coastal lifestyle, you’ll find dining options that excite even the most refined foodie. 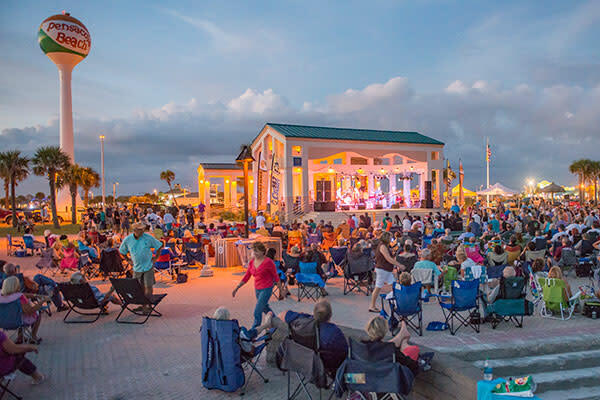 From ‘shrimp po-boy in hand and feet in the sand’ style restaurants like Flounder’s Chowder House or Peg Leg Pete’s; to “fun for the whole family” options like Red Fish Blue Fish; to small plates and cocktails with friends at the beachfront Casino Beach Bar; to a romantic sunset dinner at The Grand Marlin – and everything in between – there’s no better eating than on Pensacola Beach. So come hungry. A Case for the Sound - Discover the quietude of Santa Rosa Sound, flanked by gently lapping water on one side, and dunes, marshes, saw palmettos, pine trees and wind-gnarled oaks on the other. Kayak, swim or simply stroll the ever-changing contours of the land for the chance to encounter horseshoe crabs, stingrays and snails in the shallows. 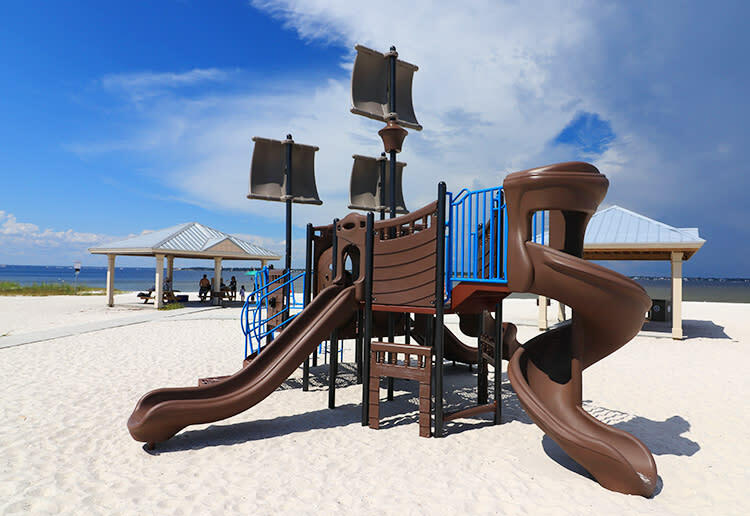 Playgrounds - Moms and dads needing a break from the beach with their little ones can head to one of three newly opened public playgrounds along the island – Harry Gowens Park, Crowley Park and Park West. Each playground offers a jungle gym, slides, monkey bars, and spinning seats and is shaded. Lifeguards - The Guardians of the Gulf have been protecting the public and promoting beach safety along the island since 1931. Today, under the direction of Chief Dave Greenwood, the 70+ lifeguards patrol the 8.1-mile stretch of the island from April to September every year. Beach-goers should check the Pensacola Beach Lifeguards website for existing flag conditions and safety precautions.